I had seen previews for this movie several times and was pretty interested but never really caught it when it came to theaters. The idea of a snail that enters the Indy 500? Classic American underdog story. I finally had the time this week to go out and rent it, and while it was fairly entertaining, it fell a little short of my expectations. 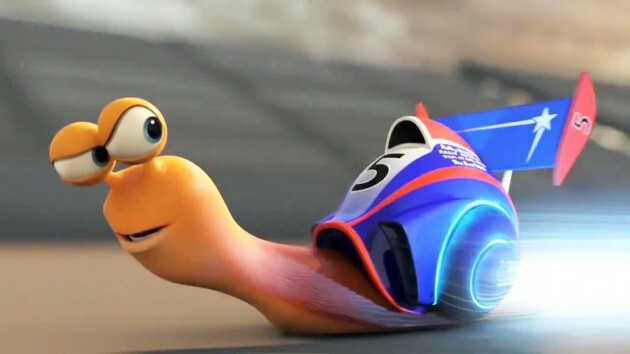 Turbo (2013, PG) is the story of a snail who dreams of speed. Obviously hindered in his desire to be a racing snail by the natural limitations of being a mollusk, Theo the snail feels stuck in a rut and unhappy with his life in the tomato garden. That all changes one night when a freak accident endows Theo with miraculous powers of super-speed, enabling him to outrun not only professional racing snails but even compete against professional racing automobiles. Theo's owner, a taco salesman named Tito, gets the idea to enter Theo - now calling himself Turbo - into the Indy 500. What did I like about this movie? The plot was neat - a snail with powers of super-speed. For comic effect, Turbo also appropriates other automobile attributes: his mouth becomes a radio at times, he has turn signals in his shell, etc. This stuff was all amusing. Supporting cast was alright - funny at times, but occasionally descending into just plain weirdness. Overall however, this movie just didn't do it for me. It was kind of like of those early Dreamworks films like Madagascar or The Bee Movie. Turbo, of course, is also produced by Dreamworks, and while Dreamworks rose above their earlier flops with How to Train Your Dragon, Kung Fu Panda and The Croods, with Turbo they revert back to their older level of "alrightness." One thing I did not like about Turbo was the constant "ghetto" theme; the soundtrack consists of rap and hip-hop music and Snoop Dogg voices one of the supporting roles. A lot of the story takes place (apparently) in the run-down suburbs of Los Angeles. With the main (human) characters Tito and his brother Angelo being Hispanics, Turbo's racing snail comrades all being black - I know a snail has no race, but it is clear that the anthropomorphic way in which the snails are presented, they are supposed to be black - and the hip-hop soundtrack gives the impression that this movie meant to target the urban market. If so, it is odd that the plot, at least in the latter half of the film, centered on the Indy 500, which is not really an "urban" focused event. Also, it was unfortunate that Turbo followed a troublesome trend that has been set by many recent films - that of a fan-role model relationship turning sour. In Turbo, the snail's hero is racing legend Guy Gagne, who of course ends up being evil in the end. This is reminiscent of Up and The Incredibles, where what ought to be an innocent fan-role model relationship becomes perverted and a source of evil. The underlying message in such plots is that role-models are inherently untrustworthy and will always let us down. I must mention Pixar's Ratatouille as a happy exception to this trend. The movie was entertaining, don't get me wrong; my kids especially appreciated some of the humor and supporting characters. Seeing Turbo racing against Indy 500 race cars was cool. It just wasn't that good and definitely not up to par with other more recent Dreamworks films. I give it a 1.5.